Now, to begin posting the stuff I found on Monday! 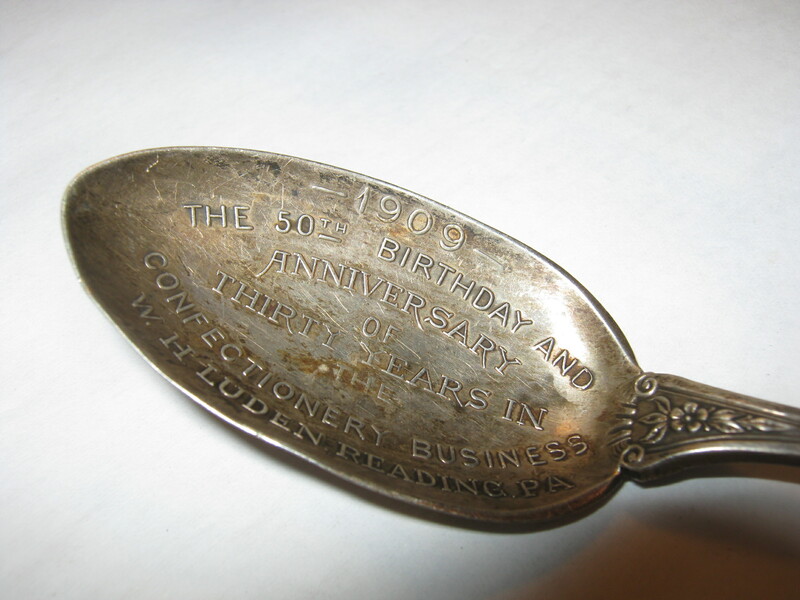 This sterling silver spoon is dated 1909. It has a somewhat confusing inscription: “The 50th Birthday and Anniversary of Thirty Years in the Confectionary Business, W.H. Luden Reading PA.” Apparently W.H. Luden was the pioneer of the menthol cough drop, which is pretty cool. I’m not sure what this is, but it’s pretty cool looking. The rope is way too short to be a necklace, so it must have been something that you’d hang on a wall. I figure it’s a symbol that I don’t recognize. Let me know if you think you know what it means! 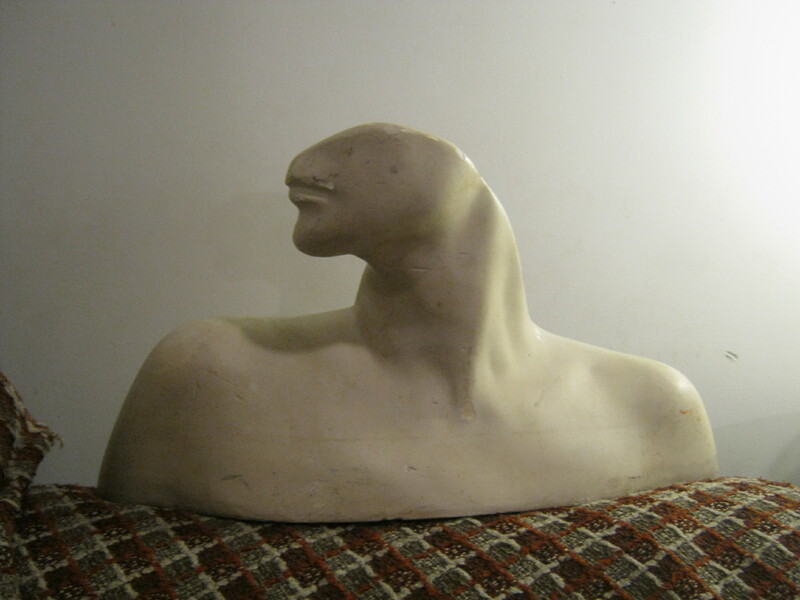 This plaster “half-bust” is pretty cool. It’s got a few dings here and there, but is otherwise pretty sweet, if maybe a bit creepy. 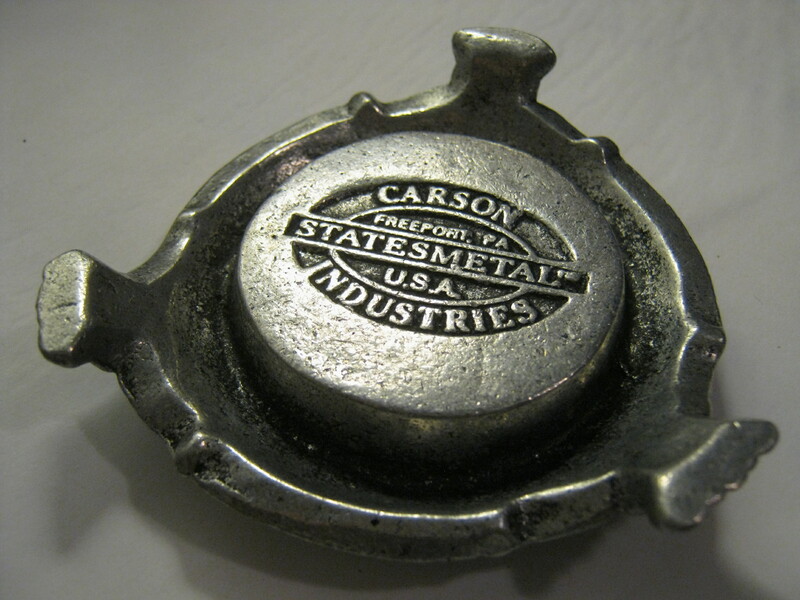 This cool little candle holder is marked as being made by Carson Statesmetal Industries out of Freeport Pennsylvania. 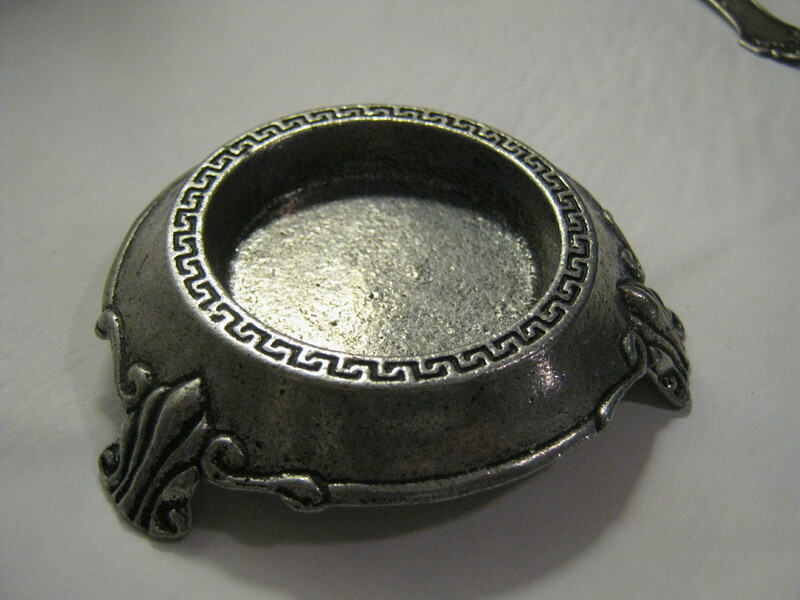 I think it’s made out of pewter. I like the design a lot so I’m thinking I’ll put it in my living room. Now a nice little tea cup from England. 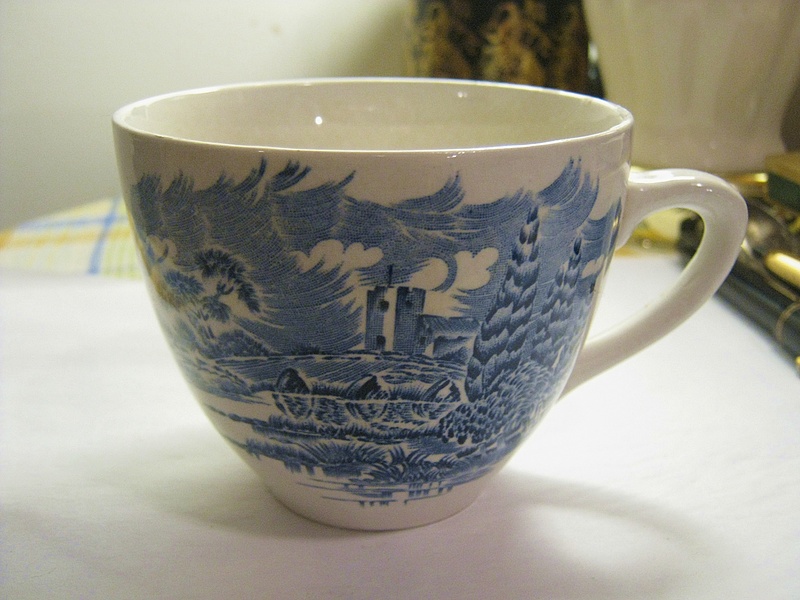 On the bottom is written “Countryside” “Enoch Wedgwood (Tunstall) Ltd.” I used to have one a lot like this but green, but it broke. I think it’ll make a good tea-cup for the house. 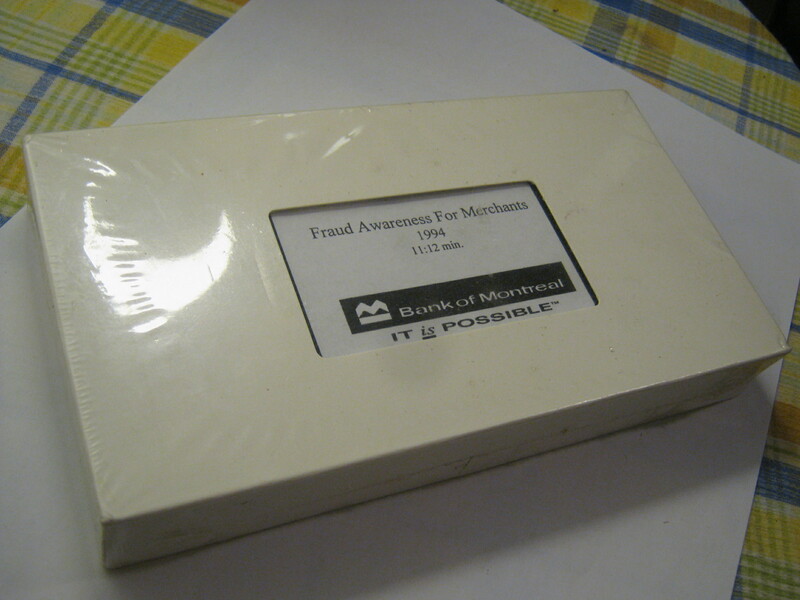 Finally, a sealed 1994 video entitled “Fraud Awareness for Merchants” made for the Bank of Montreal. I’m hoping that this video is as cheesy and “90s” as I think it can be. I’m hoping to test out that massive VCR I found with the TV I brought home recently, so I’ll let you know how it goes. I just hope the VCR doesn’t eat the tape! If it’s really good, one of my roommates is into film and all that and she said she could film it pretty easily. In other news, I put those cell-phones I found the other day on Ebay and sold them for 15$. Not bad! Lots of interesting stuff you found there. 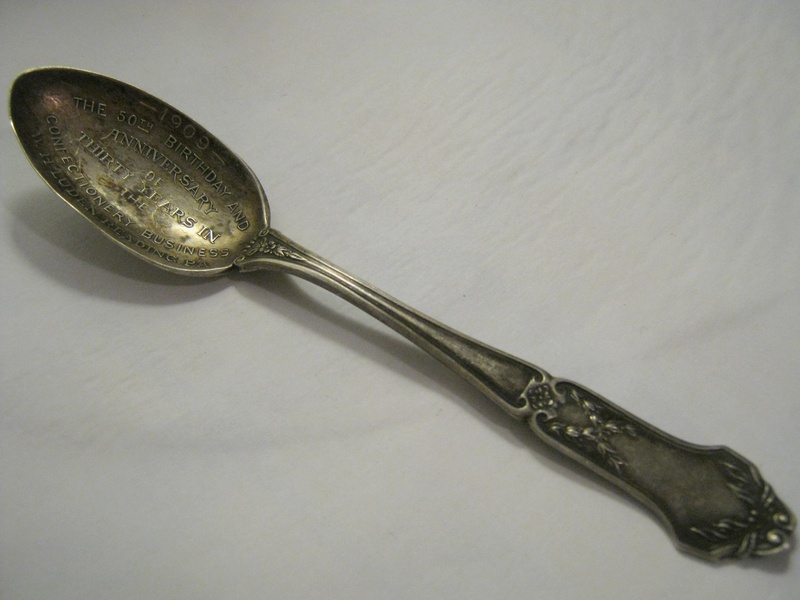 I saw a couple of (shined up) spoons exactly the same on eBay, selling for $50 and $60. That interesting enamel-looking “necklace” thingie looks vaguely funereal. Love the bust! Any marks on it? Is it broken, or was it cast that way? Thanks! There’s no marks on it, and it was cast like that. Does it have a back? If not, it’s likely a plaster cast. Here is the link – http://beingzhenya.com/2012/11/01/dumpster-diving/ I am so excited for this :))) Thank you for inspiring me! Cheers! 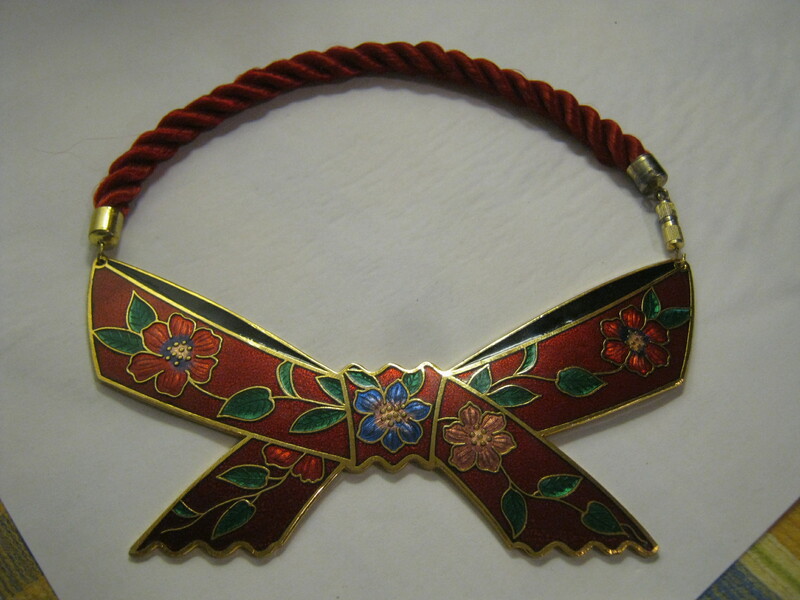 That bow enamel thingy looks like a cloisonné bracelet – isn’t that a clasp on the right side to undo and close it? You said you’ve got an Etsy store, let me know what it is as I’d like to check it out! I’ll add it to my shop faves.